Hello everyone! It has been over a month since our last post and there's no one to blame but myself. In my defense, the past month was incredibly busy with Mr. J and I moving into a new home. Fortunately, we were able to get the majority of our stuff unpacked and organized so we could enjoy the 4th of July weekend. Our long weekend was just one BBQ after another (no complaints here!). We hosted the first get together and my friend Vero brought over a delicious peach and raspberry pie from Mission Pie. With a ton of fresh peaches on hand, I decided to make my own peach pie, swapping out the raspberries for strawberries. And not to toot my own horn, but this pie was absolutely delicious! The slightly tart strawberries really complemented the bright peach flavor and the crumb topping paired with a scoop of vanilla ice cream is just drool-worthy. In a small bowl, combine the flour, brown sugar, and rolled oats; using your hands, work in the butter until large clumps form. Cover and refrigerate until ready to use. In a large bowl, toss together the sliced peaches and strawberries, flour, and brown sugar until combined. Set aside. Preheat the oven to 375 degrees F. Roll out a single pie crust into a 12-inch circle on a floured surface to prevent sticking. Transfer to a 9-inch pie plate and trim the edges. Crimp the edges with your thumb and index finger. 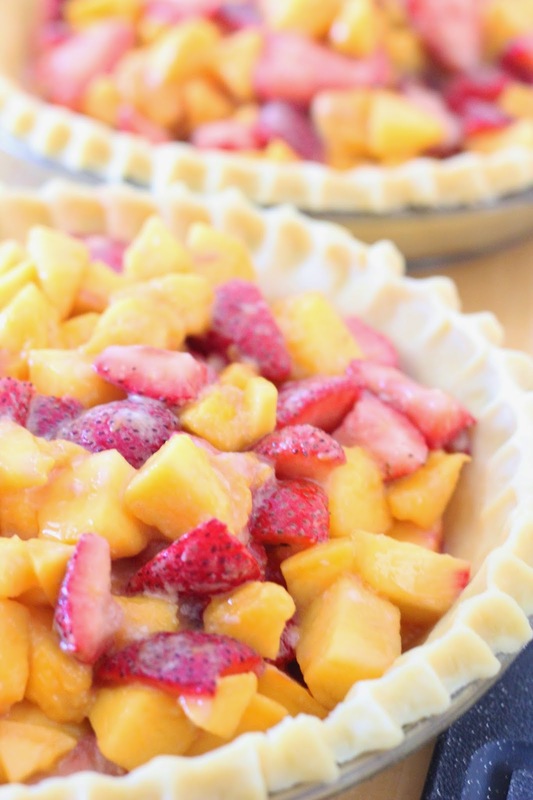 Transfer the peach and strawberry filling to the pie shell. Break the crumble into medium to large size pieces and sprinkle evenly over the top of the pie. Place pie on the middle rack with a lined baking sheet underneath to catch any juices that spill over. Bake for 1 hour 15 minutes, until the juices are bubbling and the crumble top is golden. Cool on wire rack and serve with a generous scoop of vanilla ice cream.